A game that only asks one question, how will you die? Project Zomboid is a fantastic open world zombie survival game that will give you countless hours of fun. This game has been in early access for about a half a year and still has many great features, which makes this game very enjoyable. Keep in mind that this game is in early access so it will have bugs. Project Zomboid is a zombie apocalypse simulator that encourages you to survive instead of fighting off waves of zombies and has a different graphical style that may not appeal to everyone. This game starts you off in a huge world infested with many different zombies, which you can fully customize. Before you spawn, you have the chance to change what you look like, your name, your occupation that gives you certain benefits and allows you to choose your traits. For every good trait you need one or more bad traits to balance it out making this game very realistic. However when you customize what you look like, it is too small to see. After spawning, you must search for supplies and then try to find a safe house to survive. You have a panel for your health bar and it also shows what body parts are hurt when you are bitten or scratched by zombies. You also have an inventory panel and a panel for looting as well. You can craft your own house and settle down or maybe be nomadic and crash at other’s houses. There are many ways to play this game and you choose your own. Although it is pretty straightforward on what to do in the beginning, this game is much harder than it sounds and even after a month of survival in game, you will realize that it is still just the beginning. The gameplay is great and very realistic in this game. Whether you are fishing for food or stealing from other’s houses, you do what you have to do to survive in this game. Since this is a sandbox survival game, there are a number of ways to survive or thrive in this game. This game allows you to craft weapons, barricade and cook using tools and items you find in game. Depending on your character, your emotion can change in game. You can get into a state of panic and also have to deal with depression, boredom etc. Your electricity can stop working, the zombie hordes can migrate and the seasons change. Once you play this, you will see how realistic the gameplay can get and I really enjoyed it. Multiplayer has also been integrated but I can’t talk too in-depth about it since I never really could get into any of the servers. These are some of the things that the developers had promised about this game they actually integrated all of it. One thing that is not included in the game is a proper story. I think that a story in this game would make it a lot more enjoyable than just trying to survive and its great that they actually listen and are working on putting a story mode. This game also has a few problems with the frame rate but that should be fixed soon enough. Also, it doesn’t feature a proper tutorial yet so it might be a little frustrating when you get started. Project Zomboid has a unique graphical style that may appeal to some people but also may not appeal to some. It’s hard to explain what it’s like but I think it’s cool although it looks outdated. It may not be very advanced but it fits the game well once you get your hands on it. This is a game that proves that a game doesn’t have to have good graphics to be good. Overall, I think Project Zomboid is a great game and a lot if it has been finished despite it still being in Early Access. The graphics are a bit outdated but I think the style they are using is what this makes this game different than all the other survival games. The music in this game is great and it provides a great atmosphere for a zombie apocalypse. The game is both exciting and thrilling once you get the hang of it and even though you know what the ending is going to be like, you will find yourself playing it over and over again because its really about how you die that really makes this game fun. I enjoyed this game very much and will still keep playing it. 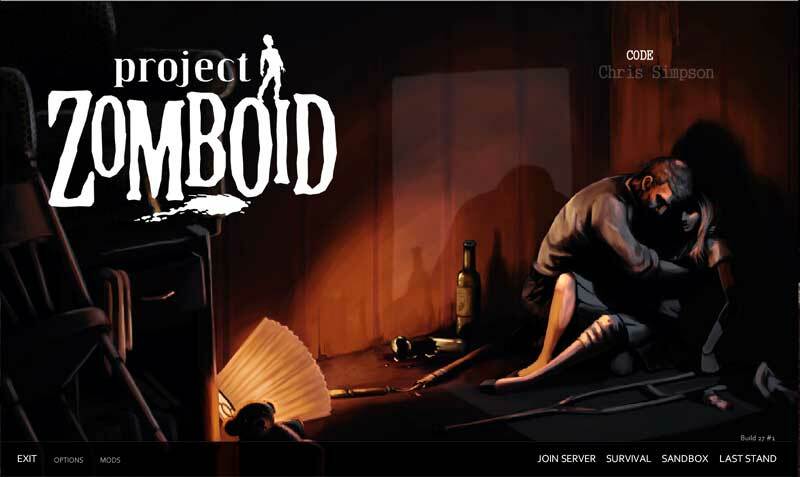 It is definitely worth a buy for only fifteen dollars on Steam and I recommend getting Project Zomboid. Even though its still in early access, it almost seems like a full game and is crazy fun to play. Dude. Great Writing! I hope to be as great as you one day!